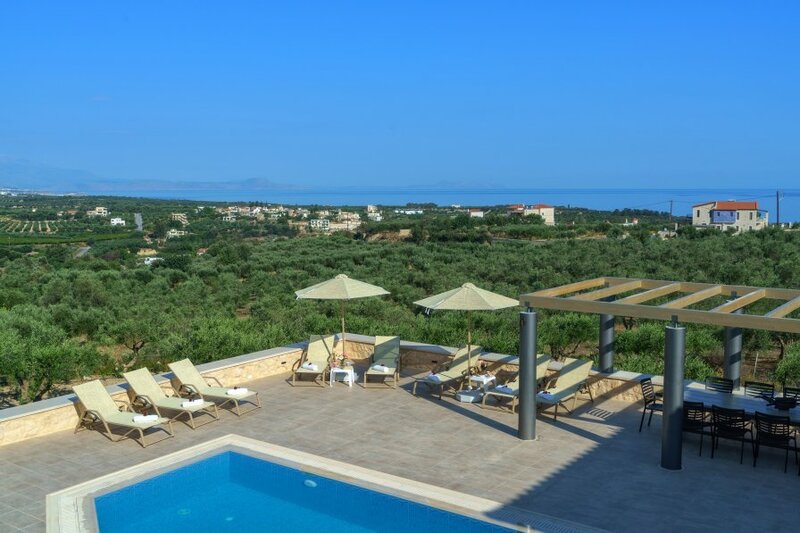 Villa Aria is a newly built villa (completed in 2016), made of stone and wood, situated in a plot of 2 acres, in Asteri village, in Municipality of Rethymno. Villa Aria can host up to 9 people. It has 4 bedrooms. Two of them have a double bed, the third bedroom has 2 single beds and the forth bedroom has 2 single beds as well as a loft, where a third person can be accommodated. All bedrooms have their own bathroom, one of which has a bath and the rest have showers. There is also a WC for common use. Villa Aria has a spacious playroom, where numerous activities can take place. In that area the guests can relax while watching a movie, or while enjoying their favorite music, or playing board games. This room is ideal for kids to play and enjoy themselves. It needs to be mentioned that Villa Aria has been designed in a way that is accessible for handicapped guests that use a wheelchair, since the villa is situated on the same level with the yard. Also, the bedroom that has the loft, as well as the bathroom of that bedroom has been designed in order to be easily used by the handicapped visitor. The Villa Aria’s kitchen is fully equipped with electrical appliances and the necessary equipment. Also the living room has a fire place, which makes winter holidays an amazing experience, since it keeps warm not only the living room, but also the kitchen. All bedrooms have a/c as well as heat pumps, which means ideal temperatures during the winter period! Villa Aria has a pool of 40sq.m, with a separate section for kids. Also the pool area is equipped with sunbeds and umbrellas. At that area is also a barbecue and a wood-fired oven and a pergola that allows the visitors to stay outside for as long as they wish, without worrying about the sun! The view from the pool area is amazing and will take the breath away from any visitor. Parking is not an issue for our guests, since there is space for three cars to be parked next to Villa Aria, inside the private plot’s area. a)Long stay discount 15% for reservations 15 days and more. b)Last minute discount 20% for reservations 20 days before check in.